but he can’t Ski or Skate. Ever since reading about the famous bull run in Hemingway’s books, Ruben has been fascinated with everything about Pamplona. Ruben’s technique for survival is to run FROM the bulls, not WITH the bulls. Ruben believes in making your life an adventure. In 2010, he and several of his friends flew to Africa and climbed Mt. Kilimanjaro. At 19,340 feet, Mt. Kili is a mile taller than any mountain in the Rockies. The toughest part for Ruben was spending five nights in a tent with no shower. at the Salt Lake City Olympics. 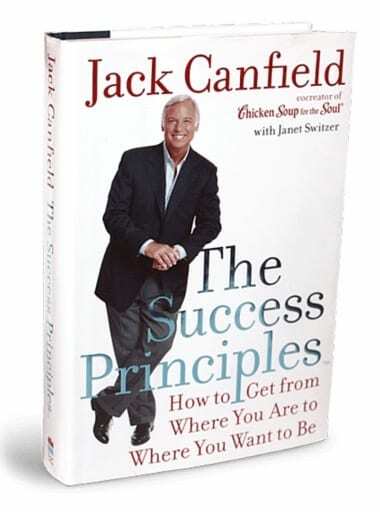 When Jack Canfield heard about Ruben’s Olympic story, he used it to illustrate three of the success principles in his bestselling book: Principle# 4 – Believing (Your Dream) is Possible, Principle #13 – Taking Action, and Principle #63 – Start Now!…Just Do It! 6 – Ruben has Traveled to over 50 Countries. Ever since he was a child, Ruben always loved airports. Between his athletic career and his speaking career, he’s gotten to visit lots of them. Ruben speaks fluent Spanish, some French, German, Italian and good Pig-Latin, so he makes friends wherever he goes. International audiences love Ruben’s presentations because he can relate to people from around the world. Ruben’s client list reads like a Global Corporate Who’s Who. He’s spoken in Japan, France, Canada, Poland, Puerto Rico, Switzerland, South Africa, Spain, USA,Panama, Sweden, Tanzania, Vietnam, Singapore, United Arab Emirates, Mexico and Colombia. World War II Airplane over the Pacific. Ruben is a private pilot. After a speaking engagement in California, he got to fly a 1933 Stearman Biplane over the Pacific. In between loops and barrel rolls, he chased whales along the coast. Ruben says that since you only live once you’d better make your life an adventure everywhere you go. On a long flight to South Africa for another speaking engagement, Ruben thought, “Skydiving in South Africa, that has a nice ring to it.” After his presentation to a group of insurance salesmen, he jumped off a perfectly good plane and got to see South Africa in a unique way – from the top down. 9 – Ruben Rappelled down a 23 Story Hotel. After speaking at a convention in Houston, Ruben climbed to the top of the hotel and rapelled down to a crowd of people below. You never know what may happen when you bring Ruben to speak for you. Books changed Ruben’s life. Today Ruben uses 100% of the proceeds from the sale of his books to build libraries in Third-World countries. He’s built libraries in VIetnam, India, and South Africa. Education is the best way to help people better themselves. Every time you buy one of Ruben’s books, you get inspired to pursue your dreams and you help people around the world create a better life. and Raised in the US. Ruben speaks fluent Spanish. In fact, The Napoleon Hill Foundation hired Ruben to do the Spanish voice-over for the audio book version of “Think and Grow Rich.” Ruben’s also written the foreword to the Spanish version of the “Think and Grow Rich” book. Although 95% Ruben delivers his presentations to English speaking audiences, a few times a year he speaks in Latin America or in Spain. You could say Ruben goes both ways… Spanish and English, that is! 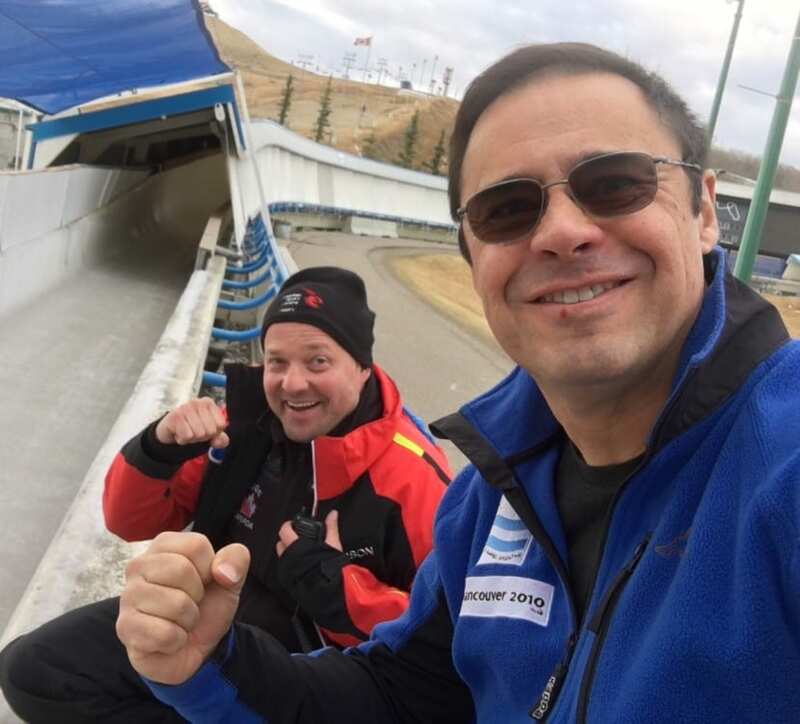 In 2017, at the age of 55 and after his third 7 year break from the sport, Ruben, who’s like the Brett Favre of the Olympics, started competing again and is sliding better than ever. He is by far the oldest competitor in the Luge World Cup Circuit proving that age is just a state of mind. 13 – One of Ruben’s Olympic uniforms is in the Olympic Museum in Lausanne, Switzerland. After a lifetime dedicated to the Olympics, Ruben feels humbled and honored. 14 – Ruben is Training to Swim from Alcatraz to Shore. In December 2016, at the age of 54, Ruben, who could only dog paddle at the time, decided to learn how to swim properly. He learned how to swim, got coaching from a Navy Seal, and is currently training to swim 1.5 miles in frigid, shark-infested waters from Alcatraz to shore. Afterwards he intends to celebrate by eating a shark steak at the Fisherman’s Wharf.